In a large saucepan, combine water and bouillon. Add broccoli and onion. Bring to a boil; reduce heat. Simmer for 10 minutes or until broccoli is crisp-tender. 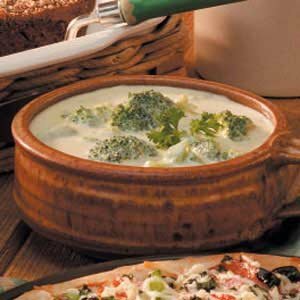 In a large bowl, combine the soup, milk, sour cream, parsley and pepper; add to broccoli mixture. Cook and stir for 3-5 minutes or until heated through. Makes 6-8 servings.